Taken during the early 1990's this is the oldest of the shots included, these two youngster were making a bit of money during the summer and they were doing well. Here Gerdy Commane is joined by a young player. An outdoor session outside Crotty's, Kilrush Co Clare. Crotty's was the home of Mrs. Elisabeth Crotty, nee Markham. 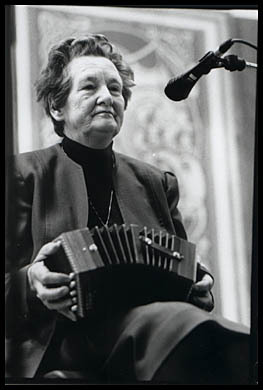 These days it once more becomes a centre of concertina music for one weekend in August during the annual Eigse Mrs. Crotty. 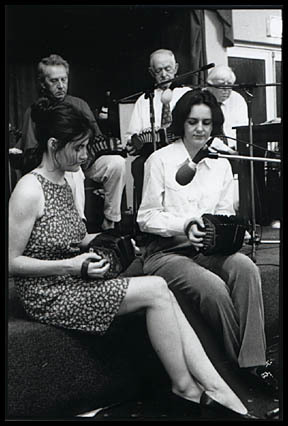 In this session Una Grogan, Dympna O Sullivan (both concertina teachers at the weekend), Mick Mulcahy and Gerdy Commane all play the concertina. They are joined by Mick's daughter Louise on the flute. Listening in is Pat Costello of Clare Fm. In the middle of it all, having a drink is Nora Commane, Gerdy's wife. The backroom of Hillery's in Miltown Malbay is a good place to have a tune. Lit only by a 60 Watt bulb it is not the greatest place to take photographs (all these photographs were taken in available light). I just about managed to capture Mary MacNamara's concentration but the exposure was tight enough. 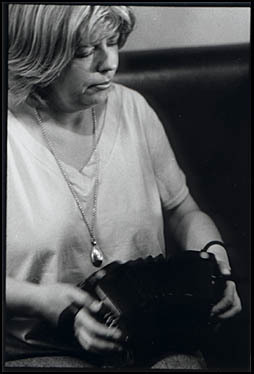 From the triangle between Cree, Kilrush and Lisseycasey, that great hive of concertina playing is Yvonne Griffin, a player of great music. Her sister Lourda is also a fine player. 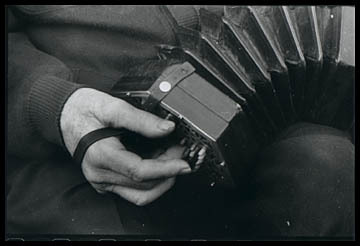 Bought in London in 1950 for the sum of �14 Gerdy Commane has played his Jeffries concertina ever since. This is a close up of the players hands. Born in the townland of Ballyknock near Kilnamona, Co Clare in 1917, Gerdy Commane became a recording artist at 83. 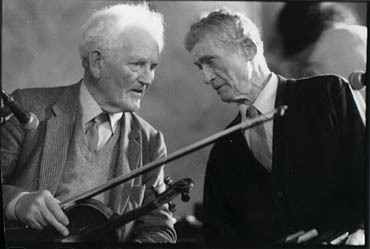 Together with fiddleplayer Joe Ryan he was recorded for the CD Two Gentlemen of Clare Music. The two of them are discussing tunes here during the launch of the CD at the Queen's cafe in Ennis, May 2000. An unusual gathering of different styles. And they played surprisingly well together too. Some years ago, Ciaran MacMathuna gave a talk about his recording experiences for RTE during the 1950's. The location was the Fall's hotel in Ennistymon and Ciaran was joined on stage by a host of musicians including Paddy Canny, P.J. Hayes, Peadar O Loughlin, Brid Donohue and George Byrt on the piano. This is the concertina section of the group: slightly embarassing the name of the woman on the right escapes me, on the left is Myriam Collins and on stage are Tommy McCarthy and Chris Droney. Ciaran Mac is hiding behind a mike on the top right. 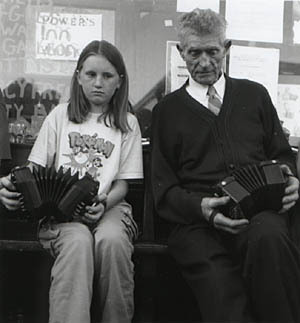 Possibly one of my favourite musicians, Kitty Hayes from Shanaway, Miltown Malbay played the German concertina when she was young. 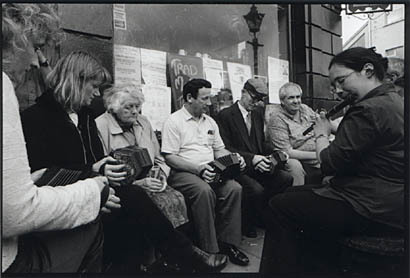 At the Dunsallagh Feis of 1936 she saw Junior Crehan and whistle player Josie Hayes play. 'And I thought they were wonderful' she tells me. She married Josie and like many women of her generation she had to give up playing an instrument while raising her family. She was never far away from the music, she is a wonderful singer. Kitty is full of stories, like how she travelled to Kilrush with Josie and Paddy Killoran (who was married to Josie's sister) during the 1950's to see Mrs Crotty. One night after Josie died during the early 1990's Kitty was at the weekly session in Gleeson's of Coore. 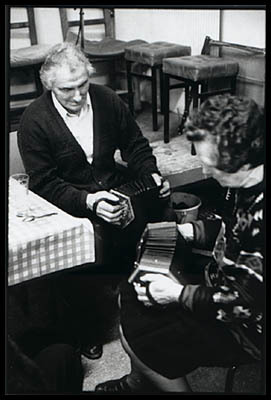 Jacqueline and Tommy MacCarthy were there and Jacqueline encouraged Kitty to have a go at her concertina. With a bit effort Kitty managed a tune. 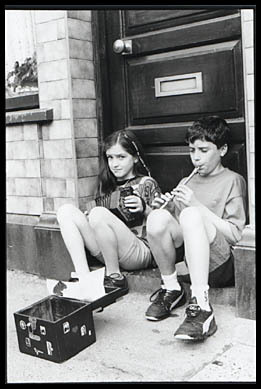 She bought herself a wheezy German concertina and never looked back. 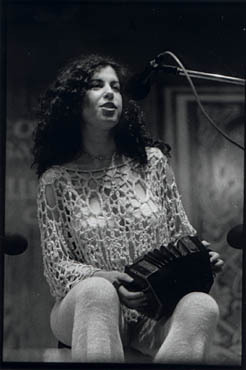 Here she is at a Willie Clancy Summer School concert, trembling with nerves on the big stage but she played wonderfully. Another player from the South West end of Clare sometimes comes to our session in Gleeson's of Coore. Unexpected Gerald Haugh will arrive with his friend, fiddle player 'Buddy' O Connell and fill the night with wild music. Here he is playing a few tunes with Kitty Hayes after the big session ended on Christmas eve some years ago.